I had some overripe apricots crying in the fridge from neglect. I don’t like to eat them when they get overripe, and this recipe popped into my head. I made this two years ago, but with eggs. Today it has been veganized and I think the world is better because of it’s goodness. Try it and let me know what you think! 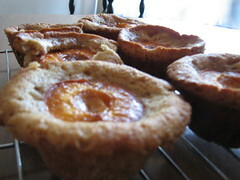 The apricot melts into the middle of cake. Although it looks like a muffin, don’t be fooled, it is rich and buttery. Grease up your muffin pans. Add vinegar to cashew milk and let it sit while you mise your stuff. Add applesauce, mix until well combined. Add flax goo, mix until well combined. Add zest and vanilla, mix well. Add flour and baking soda. Mix until just incorporated. Add cashew milk/vinegar and mix. DON’T overmix, or it won’t rise all pretty. Spoon batter into tin, filling about halfway full. Cool for a few minutes and enjoy. There is some solid information on this page. I like how you put things. I’ve added the feed to my Google Reader RSS subscriptions and will check back often. I did get some errors with how quick the website loaded. Might be something to check out. Yay google is my world beater aided me to find this great website !